Hello there! Are you ready for more pictures of my next AA entry? I have been trying to decide on which to show you next, and I have decided on one of my 3D projects. I hope you have been enjoying the hop so far, I loved Amy's project, and I hope you did as well, so sit back and relax and check out the wreath that I made. 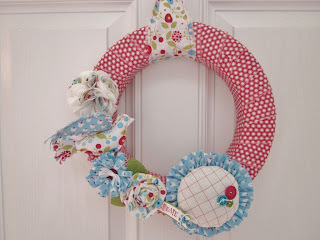 This whole wreath was made with just one pack of our summer smooches fabric. You can change up the fabric for a different look or season. 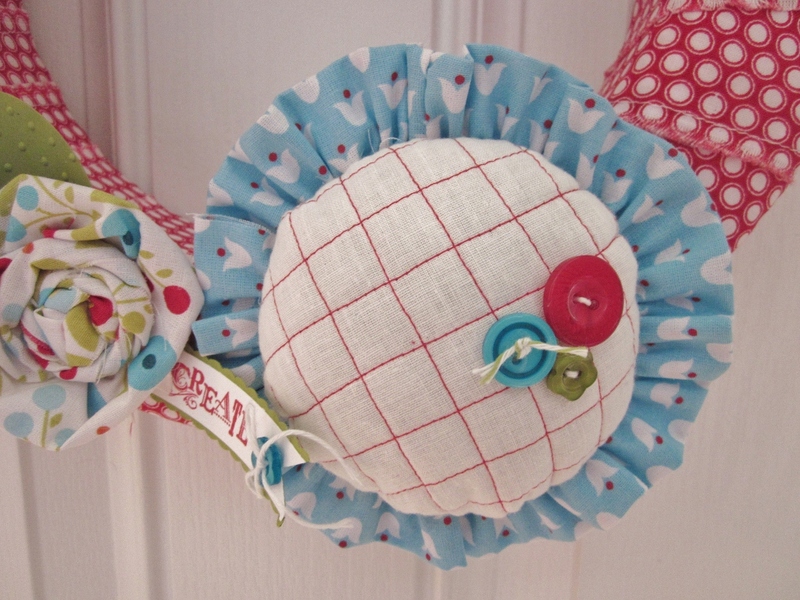 Our retired SU fabric is on sale, so head on over to my ONLINE STORE to get some great fabric and matching buttons ON SALE to make your own wreath. This bird started this whole idea of a wreath for me. I liked the elegant bird bigz die and thought a cute stuffed bird would be great. Only problem was, I didn't have the bird die. So online I went to my wonderful group Pretty Pals to see if someone there would cut the fabric for me. Ginger Toivonen graciously cut all the necessary parts for me and mailed them right out. Thanks again Ginger! The tail had numerous feather parts to make it nice and fluffy. 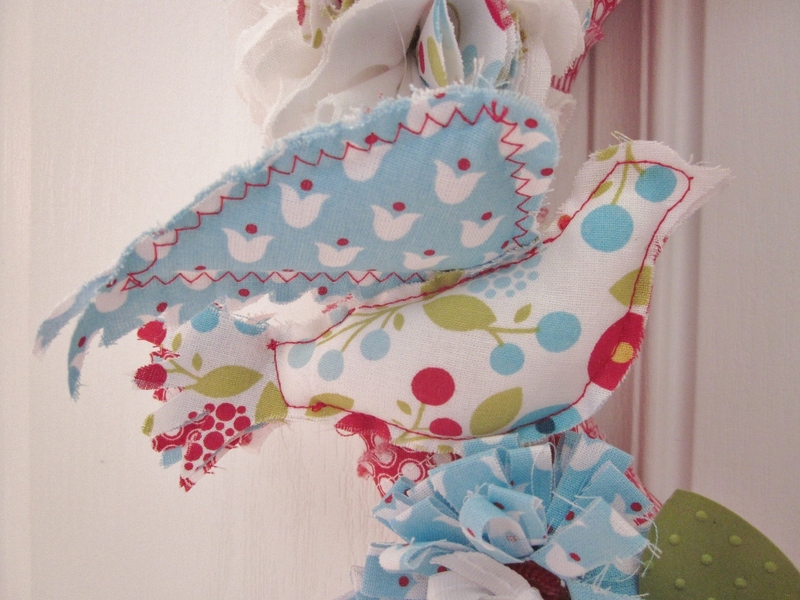 The bird and wings were stuffed and sewn with fun red thread for a nice punch of color. I frayed all of the edges for a shabby chic look. I made these flowers using different flower techniques, I wanted to incorporate stamping and card stock to give my wreath different textures. A simple rolled rose has card stock leaves, and a cute create flag banner. This is just a half round styrofoam circle, I made my own pattern just by sewing batting on the back of white muslin using red thread in a square pattern. It was super easy and adds a lot of design interest. Brights buttons with some bakers twine give it a bit of flair. 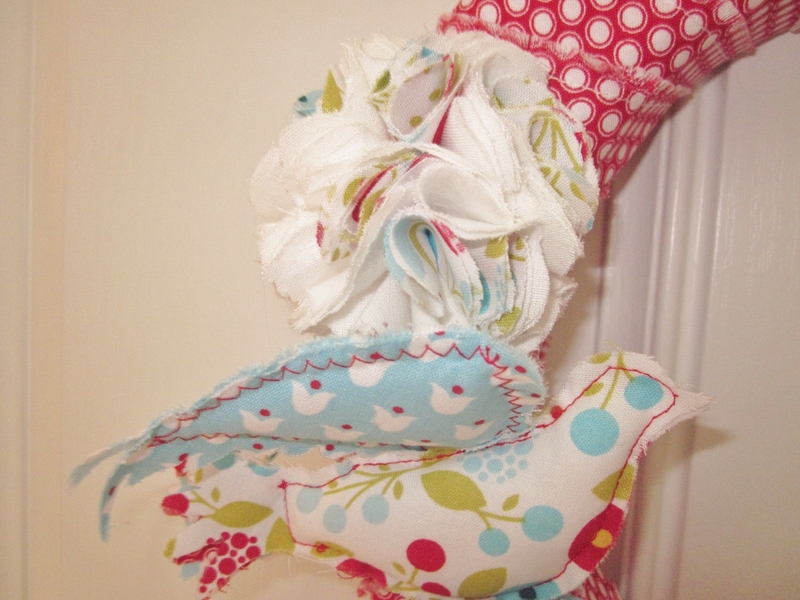 A simple folded piece of fabric, sewed and gathered makes a great flower edging. Here is another folded fabric flower, very easy to make. In this picture you can also see the red fabric that was cut into 2 1/2 inch strips and sewn together at the ends to make one long strip of fabric. I sewed one edge about a 1/4 inch in and frayed the edge for some dimension. The long strip of fabric was just wrapped, glued, and pinned on a styroform wreath base. To hang my wreath, I just sewed a seam on both sides of a piece of fabric, frayed it and knotted at the top. 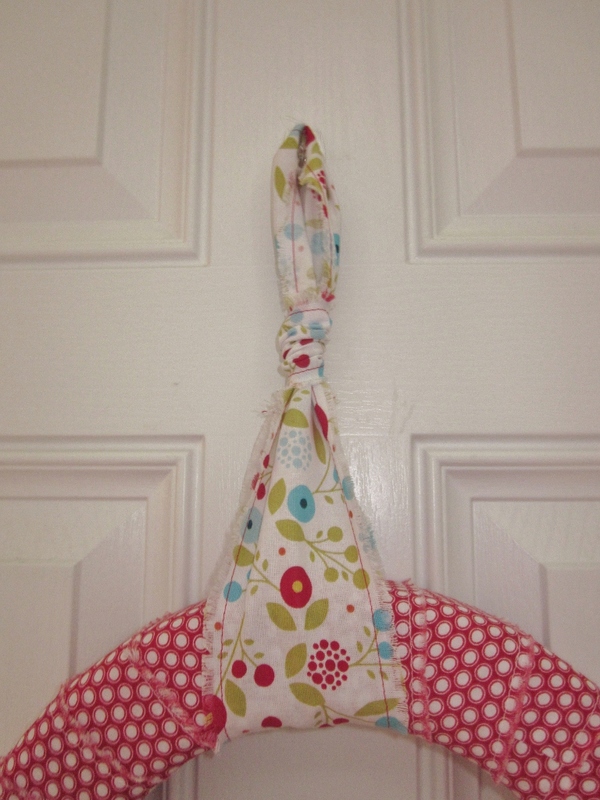 An easy way to make a pretty hanger. This wreath really did not take too long to do, and since I have given you the basics, you should be able to recreate it in a few hours. Hop on over to see what Amy Rogers at Amy's Stampin Creations has to share with you today, she makes such wonderful projects! Remember, if you get off track, click on the links below to get you back on track. I hope you were inspired today, enjoy! What a beautiful wreath! 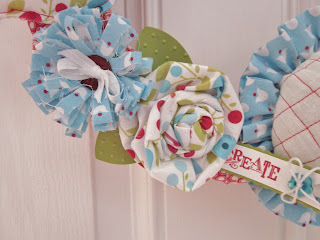 LOVE how you created such different flowers with all of that fabric! Great job, Sandie! Love this, Sandie! The red thread is such a fun detail, and the I love the variety of flowers. Sandie, this wreath is a work of art. I love that particular fabric and you incorporated it into your project very well! Gorgeous, Sandie!! This is so beautiful! 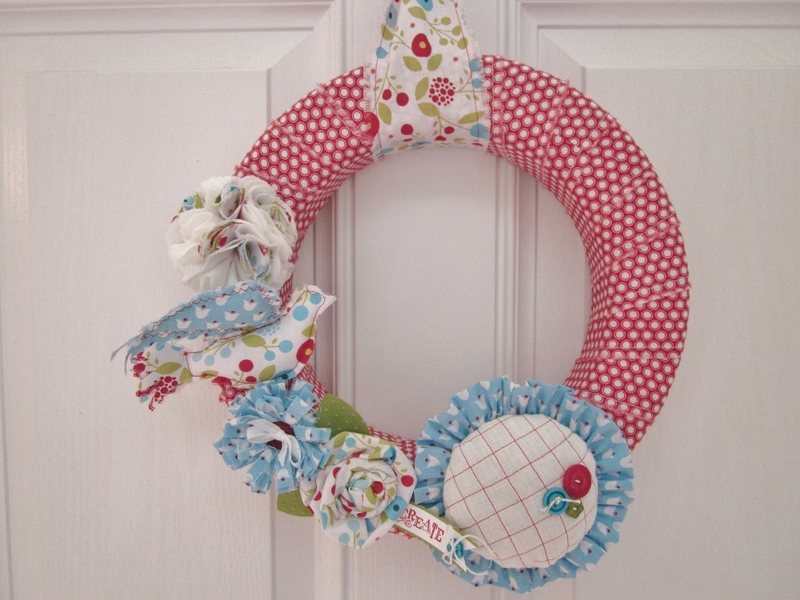 Love the fabric wreath. 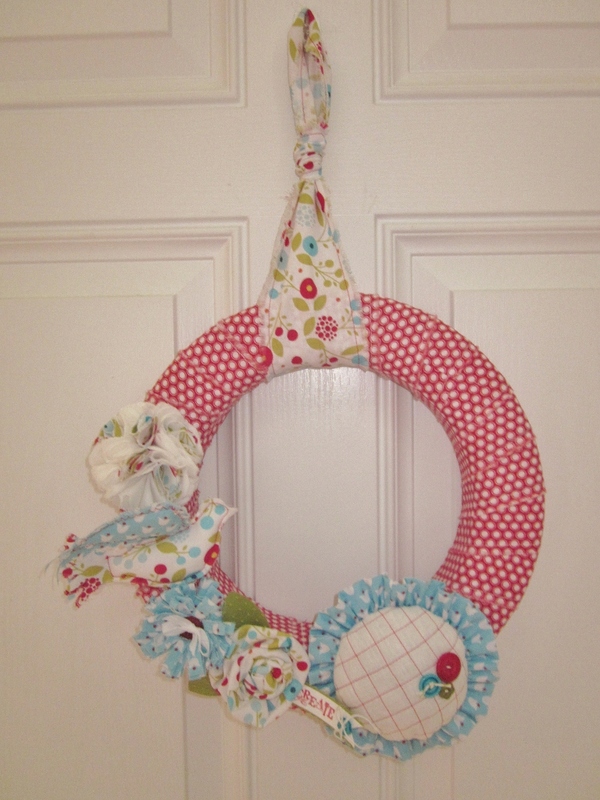 I've been chicken to try a wreath, but will definitely do it now. I love all the different flowers you made - really hilights the presentation at Convention well too. Great work! LOVE, LOVE, LOVE!!!! Great way to use the fabric!! So cute!!! Amy L.